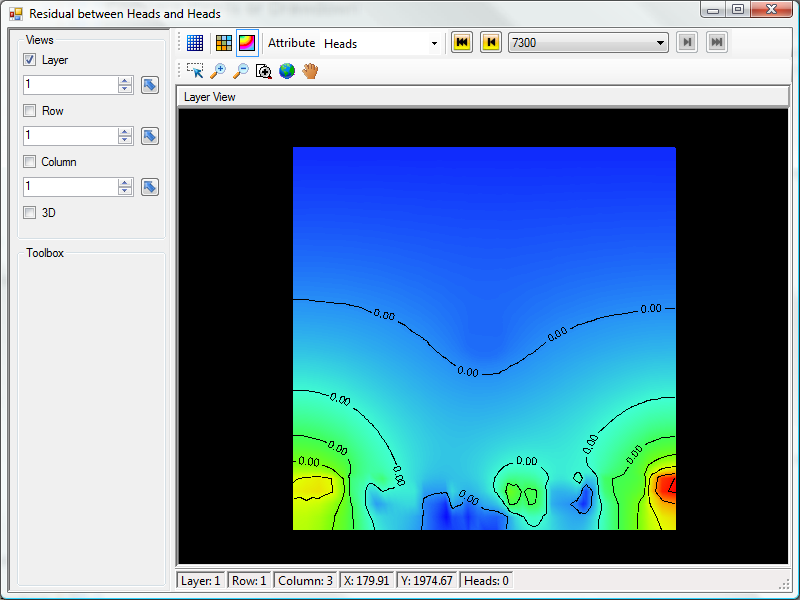 Visual MODFLOW Flex allows you to compare Heads or Drawdown between several model runs. This is useful to determining differences in pre and post pumping heads or comparing impacts to heads or drawdown when adjusting property or boundary condition parameters. •Select a MODFLOW .HDS file from the hard drive, from another model. Click on the Open folder button and browse to a .HDS file on the hard drive. •Click OK. A new view will appear. The plot shows the results of subtracting the heads selected specified above from the Heads where you launched the `Compare Heads` option. The same option is available for Drawdown. Just launch `Compare` from the Drawdown node on the Output model tree, and choose the Drawdown from another model run, or a .DDN file from the hard disk.